For four decades, Ronald McDonald House Charities® of Chicagoland & Northwest Indiana (RMHC®-CNI) has been a haven for more than 100,000 families with hospitalized children. This year, in honor of its 40th anniversary, the organization is rolling out a new campaign called “Raise the Roof” to help further their mission of providing comfort, compassion and a sense of community for families facing the most critical moments of their child’s health. The celebrations officially kick off during RMHC®-CNI’s 40th Anniversary Gala Presented by Wintrust Bank on April 22, 2017. The Gala, which is RMHC-CNI’s largest annual fundraising event, generates substantial monetary support needed to ensure the organization’s continued ability to “Raise the Roof” over the heads of families for years to come. With more than 41,000 volunteers in 2016 alone, RMHC-CNI is thrilled to announce hitting a major milestone — more than one million volunteer hours logged during its 40 years of service. This year RMHC®-CNI is challenging friends, family, supporters Chicagoans to help “Raise the Roof” even more, by donating time or money toward making an exponential impact on the communities of Chicago and Northwest Indiana. 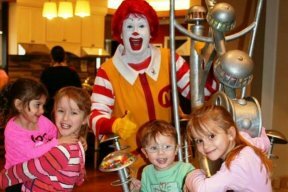 To donate to RMHC-CNI, visit http://m.rmhccni.org/donate/. To learn more about becoming a volunteer, please visit http://rmhccni.org/volunteer/ or call one of our five local Houses or Family Rooms. To learn more about the Gala, please visit http://rmhccni.org/gala/ or call to purchase tickets.